All Liberator Shapes are designed to work together to create a customizable experience. Shop the Wedge/Ramp Combo for more angles and positions. Short - 32"x24"x10", Regular - 34"x24"x12", Tall - 36"x24"x14"
What is the actual degree of the angle and slope ie it looks like its almost 45 degrees of rise ? can this be folded in half to fit into a suitcase for travel on Airlines? Unfortunately there is no way to fold the Ramp as it is a furniture piece. A lot of people say the foam is firm? I was wondering what the density is or if there is something common to compare it to? 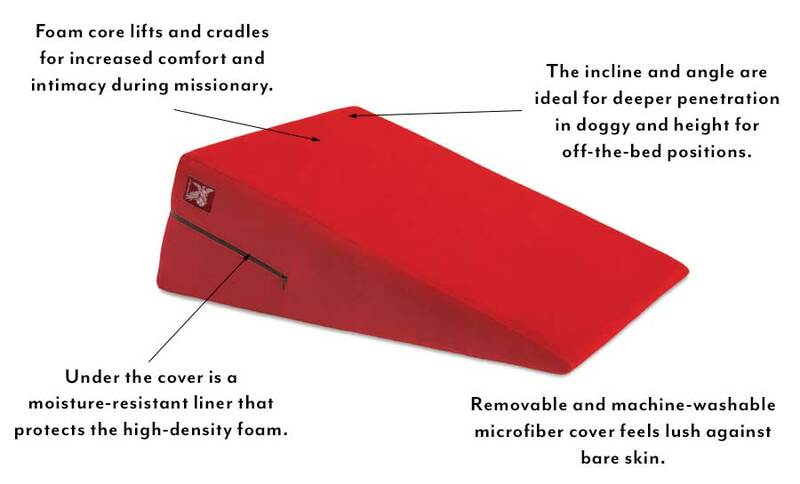 The foam used in the Ramp is a furniture grade foam, designed to be sturdy and comfortable as well. How do you determine which size? What size would you get for 5'3" woman? Thank you for contacting Liberator. I will be glad to assist you with your questions concerning the Ramps. Before I can give the size recommendation, there are several factors that need to be considered. To start, the height of the Ramp would actually be determined by the inseam of the male partner. If the inseam is up to 34" we recommend a short, 34" to 36" we recommend a regular, and if the inseam is over 36" we recommend the tall. Now with that in mind, if the woman is between 200 - 250 lbs we typically recommend a Plus Size Ramp instead of a regular. Another factor is the type of bed you have. If the bed is very soft then you will need to purchase a size taller than typical. I understand that this is a lot to take in so if you have any further questions or would like a better clarification, please contact us by phone at 866.542.7283. Have a wonderful day. $175 price of the ramp includes cover or I will have to buy it separately? Thank you for contacting Liberator. Yes, the retail price does include a cover in the color of your choice, the protective liner, and the foam. You can purchase replacement covers if you ever get the urge to switch up the color! Have a wonderful day! Thank you for contacting Liberator. That is not a crazy question at all!! The inseam is typically the second number in the pants size (32x30...30 is the inseam) and is measured from the crotch area to the bottom of the pants. Hope this helps!! Have a wonderful day. In the answer to Ron's question, it was mentioned that if the bed is very soft then the next size up is recommended. That recommendation would hold for a memory foam bed as well correct? Thank you for contacting Liberator. The Ramp is made of high density foam and is designed to prevent sinking into the bed; even if it’s on a memory foam mattress. Hello I am trying to decide between the Wedge and the Ramp. Can you please explain the differences? Wedge: 14" x 24" x 7"
Essentially the wedge is a triangle that is smaller than a pillow and the ramp is a triangle the is bigger than the pillow. I'm having a hard time deciding on size. Even though my partners measurements say I should order a small, I'm afraid it won't meet my objective. My partner and I are both 5'7", he's HWP and I am plus sized. My belly gets in the way of kissing while I'm missionary. I'm afraid if I choose the short version that the upper body elevation I seek to meet his face won't be enough. Suggestions? I honestly don't know what HWP means. I would suggest calling our customer service number (770) 246 6400 and a customer service rep can help correctly size you! Sizing for the ramp indicates a small should be chosen if one's inseam is under 30". What if your inseam is right at 30" - should we get the small or regular? Since it's on the cusp I would go with the height sizing recommendation then! Height is perfect for doggy. Three sizes to fit any body type. See the size guide for help choosing which size is correct for you.